For lovers of all things Roman, there are some simply stunning historic sites in the Languedoc-Roussillon region. Lying to the North-East of the village of Lunel, this fascinating ancient site contains 3 very different attractions: The Oppidum – an iron age settlement, plus a complex and Roman bridge dating back to the 1st century AD. A visitor's centre, opened in 2011, contains a wealth of information for the history buff. The hill fort, or 'oppidum' at Carcassonne is said to date back to the 6th century B.C. Built and rebuilt by first The Romans, The Visigoths and on into the medieval era, when its reputation as an invincible hilltop fort really took hold. Today, there is still a great deal to see in the town, with its formidable 3 kilometer double fortified walls and fifty-two watch towers. Unsurprisingly, Carcassonne has been designated a UNESCO World Heritage site since 1997. This impressive network of underground passageways, tunnels and storage rooms in Narbonne date back to the 1st century BC, forming what must have been a vital part of the infrastructure of the Roman regional capital Narbo Martius. La Maison Carrée (Square House) in Nîmes in is an astonishingly well-preserved Roman temple and is perhaps the best preserved Roman structure anywhere in the world. For lovers of all things Roman, this building is a must. The temple was commissioned by Marcus Vipsanius Agrippa in 16BC, under the auspices of Augustus Caesar's empire-wide building programme. Like many Roman structures that survived the sacking of Rome, La Maison Carrée made it intact into modern times by being converted into a Christian church in the fourth century. The Lapidaire Museum in Narbonne contains more than 1,300 exhibits from Roman antiquity, including fresco fragments, remains of tombs and gravestones. Also to be found in Narbonne is the Narbonne Archeological Museum (Musée Archéologique de Narbonne), displaying some spectacular finds from the town's historic past as Narbo-Martius, the regional capital of Gallia Narbonensis. An important Roman province. Like La Maison Carrée, Nîmes Arena was constructed in the 1st century AD by the Emperor Augustus. A truly magnificent structure, rising some 34 terraces into the air and capable of seating 24,000 people. 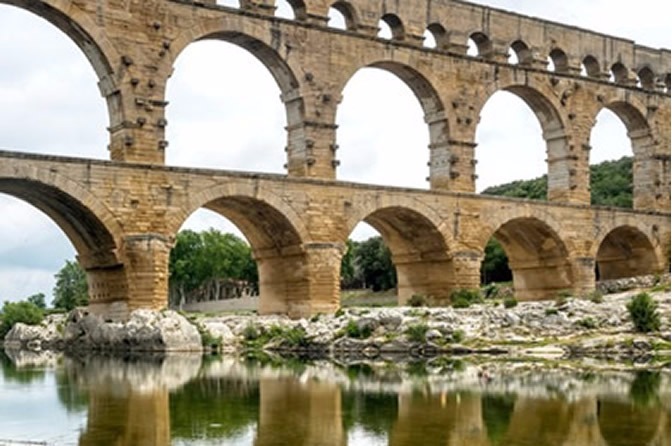 Fully restored and maintained by the city of Nîmes, it is a deservedly popular tourist attraction – offering a true taste Ancient Rome for those holidaying in Gites de France.